The following are just a few of the enormous wealth of information waiting on the Internet pertaining to the Civil War and history in general. Please feel free to email any great links to ctcwrt@gmail.com. http://8cv.home.comcast.net - The 8th Reg. Conn. Vols. Co. A. Inc. is a Union Civil War living history and reenactment organization in the greater Connecticut area. http://the2dconn.com - 2d Connecticut Volunteer Heavy Artillery Regiment. http://www.cof14thcvi.com/- The 14th Connecticut Volunteer Infantry Regiment. http://www.ccsu.edu/page.cfm?p=2296 - Central Connecticut State University. Info to all of the CT 150th events should be found here. http://www.torringtonhistoricalsociety.org - Torrington CT Historical Society. 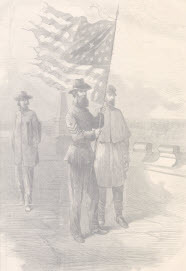 http://civilwartours.org - Historians and expert guides tour civil war sites and battlefields. Guided tours of civil war battlefield sites. http://nps.gov/ancm/index.html - Anitam National Battlefield website. Some great info on CTCWRT very own vacation get away. http://www.virtualantietam.com/ - Antietam National Battlefield virtual tour website. http://www.civilwar.org - A Civil War trust organization. A great preservation group.